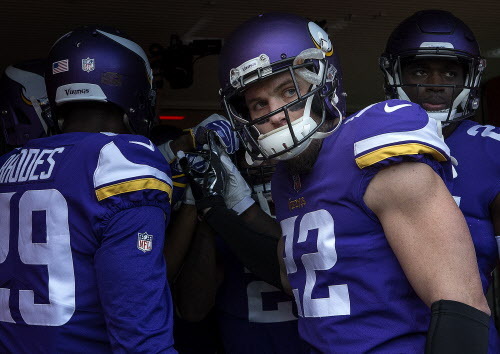 It won’t net him a free trip to Orlando, but weeks after his Pro Bowl snub, Harrison Smith picked up a more prestigious honor on Friday. Smith, who tied his career high with five interceptions while playing a multi-faceted role in the Vikings’ defense, was named a first-team All-Pro by the Associated Press on Friday. It was the first time Smith has been named to an All-Pro team; the safety and cornerback Xavier Rhodes became the first Vikings defenders to receive first-team All-Pro honors under Mike Zimmer. Rhodes intercepted two passes and broke up 10 while taking on a greater role as the Vikings’ shutdown corner than he has before. He shadowed receivers in 10 of the Vikings’ 17 games, corralling players like Julio Jones and Antonio Brown. Defensive end Everson Griffen — who set a career high with 13 sacks — and wide receiver Adam Thielen (who caught a career-high 91 passes) were named second-team All-Pro. Will Brees' playoff experience be a problem for Vikings?